1. What problems did the widow woman have? a) She was blind and deaf. b) She had no husband, and she was very poor. 2. What did the prophet ask her for? a) To have some water and bread. b) To have a bed to sleep in. 3. What was the widow's reply? a) "I do not want to give you anything." b) "I have just enough to make one little cake for my son and myself." 4. What was the prophet Elijah's promise to her? a) "The Lord will provide for you, and your flour and oil will not run out." b) "Someone will soon give you a lot of money." 5. 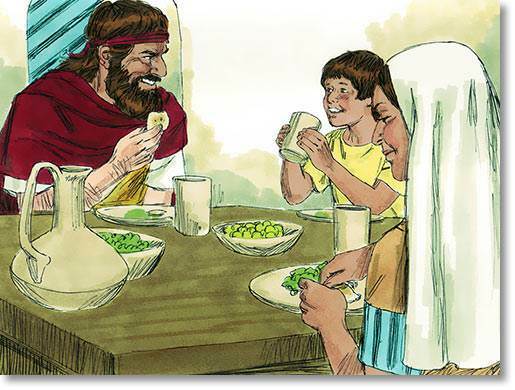 What happened after the woman gave Elijah bread and water? a) She didn’t have any more supplies for food. b) Her flour and oil did not run any lower. They always had enough.